Sedona Mills plumbs ever-deepening mysteries in the second ​chapter of The Beginning of Life: The Morning After, heaping suspense on top of her moody and atmospheric descriptions. Super-talented singer/songwriter, Loreen Legion, again provides the accompanying photographs. Ricky the Rat's dangerous game runs head-on into a technological rat trap, as Crap Mariner attests in his microfiction offering. Art Blue's episodic futurist-thriller, The Artefact, about art and technology comes to a powerful and exciting conclusion this month with the final chapter, Still Not Known. We look forward to exciting new offerings from Art (and his trusted companion, Neruval) in the very near future. Elysienne, who has written with such passion in earlier issues, pays tribute to her native North American roots with a poem, Left Behind, which is filled with rage but always straight from the heart. 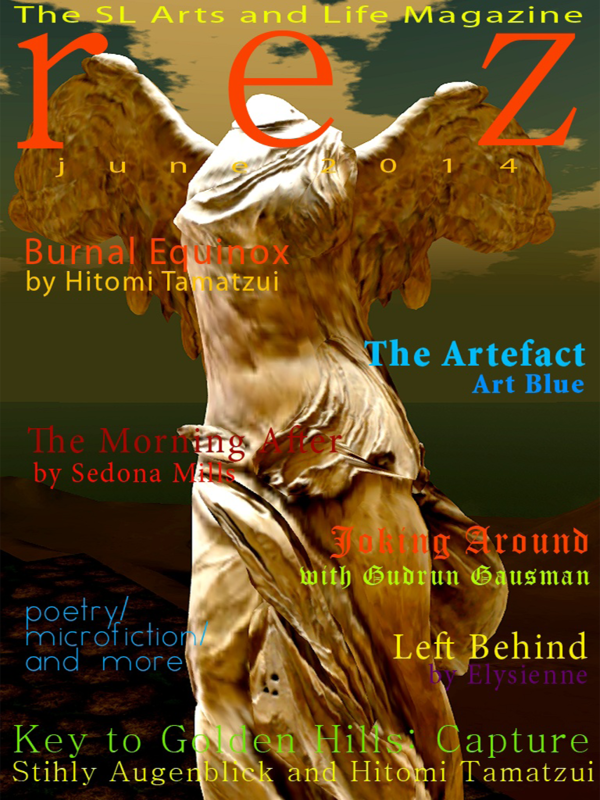 Hitomi Tamatzui covers Burn2 - Burnal Equinox for rez and brings our readers some insight into this unique annual celebration of the arts, as well as a dazzling array of wonderful images from the event. With Gimme, Zymony Guyot delivers an explosive poem on themes of greed, power, and corruption. Hitomi Tamatzui and Stihly Augenblick contribute the fifth chapter of their noir serial, The Key to Golden Hills: Capture, a dramatic study of an Asian crime syndicate. Gudrun Gausman examines the one-liner and dissects just what makes things funny in An Avatar Walks Into a Bar. Poet Adrian Blair, who has contributed such stellar works in prior issues, finds a discarded page, Page 27, that we reprint here, from An Arrow in Time.